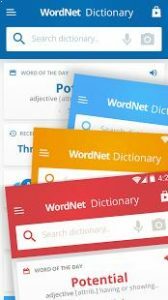 Advanced English Dictionary and Thesaurus : WordNet® is a large lexical database of English with up to 140,000 entries and more than 1.4 million words, developed by the Cognitive Science Laboratory at Princeton University. Instead of following the standard dictionary format, the WordNet dictionary is organized with an innovative and convenient approach. Nouns, verbs, adjectives and adverbs are grouped into sets of cognitive synonyms, interlinked by means of conceptual-semantic and lexical relations. In addition to the straightforward definition the dictionary shows how each word is linked to other words in terms of synonyms, opposites and similar words, but also hyponyms and hyperlinks within the group. allows you to quickly memorize words. Straightforward and precise definitions of over 140,000 words with more than 250,000 links and 1.4 million words. Synonyms, antonyms, similar and related words to help you make your writing and speech more interesting. Examples illustrate how words are used and show typical constructions and collocations. NEW! Tap to Translate entries in other apps. That particularlly dictionary has everything,which you can ask for. I would highly recomended to all of you. Superb App! Everything what an excellent should have. Just one thing is missing pronunciation feature. Please add it. Nifty dictionary. Works well, and has a word of the day feature, which I like. Not as comprehensive as some of the others around, but some are very expensive, and not much value as they haven’t been updated for quite some time. Generally a dictionary isn’t needed when my phone is online almost all the time, but for the times when I’m offline, it’s handy having a dictionary that has its data stored on the phone.